Podgorica (Montenegro) (AFP) - Several thousand supporters of pro-Russian opposition parties protested Saturday against Montenegro's NATO membership, demanding a referendum over the issue. "If the referendum is avoided and there is a bid to fraudulently pass the decision (on NATO membership) in parliament, Montenegro will be brought to the verge of a (civic) conflict," Andrija Madic, the leader of pro-Russian opposition New Serb Democratic Party, told the crowd. The protest outside parliament gathered between 2,000 and 5,000 people, according to estimates by reporters and organisers and pro-Russian and pro-Serbian opposition parties. On December 2 NATO invited Montenegro to become its 29th member, defying Russia's opposition to what Moscow branded a threat to its security. Montenegro's veteran Prime Minister Milo Djukanoy has firmly rejected calls to organise the referendum on acceding to the North Atlantic Treaty Organization. "They invited us only to have a little bit more soldiers against Russia. We (Montenegro) should not and must not take part in that game," Momir Bulatovic, former president of Montenegro and close ally of late Serbian strongman Slobodan Milosevic, told the crowd, who waved Russian and Serbian flags and chanted "Putin (is a) Serb!" and "Mother Russia!" 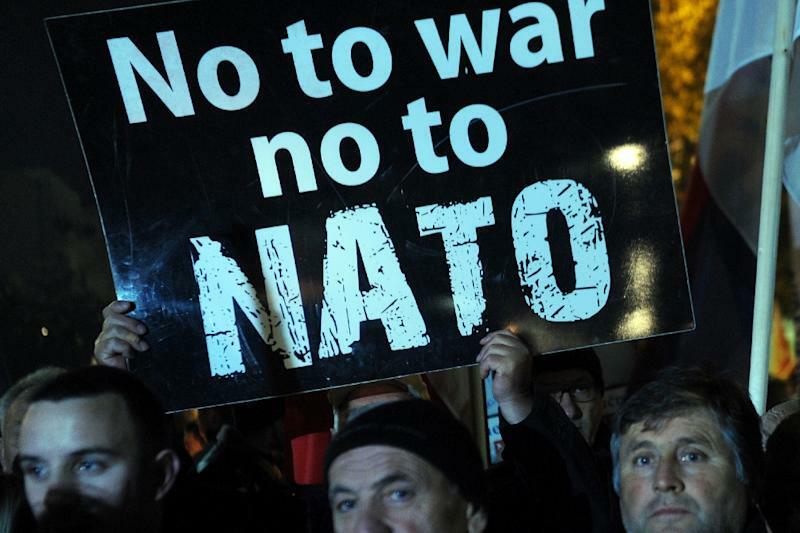 Some of the protesters carried placards that read "No to war -- no to NATO." Following the break up of communist Yugoslavia in early 1990s, Montenegro was allied with Serbia in the Federal Republic of Yugoslavia at the time of an 11-week 1999 NATO bombing campaign in Kosovo. "NATO murderers," the crowd chanted during Saturday's protest while some participants carried candles in memory of victims of the NATO bombing. "They have bombed us for more than 70 days, so how we can forgive them the victims and destruction? By no means we can forget that," said Radomir, a 46-year old electrician who refused to give his last name. The tiny Adriatic republic of some 630,000 people was allied with Serbia, a traditional Russian ally, until 2006 when it declared independence and launched a process of integration into NATO and the European Union.